by J Michael Waller, Insight, October 1-14, 2002. Where were all the Muslim and Arab pressure groups several years ago when the first warnings were raised about Osama bin Laden and terrorist-support networks in the United States? Pretty quiet, by most accounts. One of the few Muslim leaders in this country to warn publicly and repeatedly about the internal terrorist threat was Sheik Muhammad Hisham Kabbani of Detroit. As leader of the Islamic Supreme Council of America, Kabbani has been a courageous voice of moderation and American patriotism, raising the alarm–at great personal cost–about impending foreign and domestic terrorist threats and advising what should be done about them. For years he has warned about the hijacking of Islam in the United States and elsewhere in the world by a militant and violent Wahhabist sect financed by Saudi Arabia that now controls or funds a large number of mosques, religious schools and political organizations in this country [see “`Wahhabi Lobby’ Takes the Offensive,” Aug. 5]. Traditional, “moderate” American Muslim leaders, for the most part, have felt too isolated, outnumbered and intimidated to resist. Wahhabi-linked groups worked hard to marginalize Kabbani as a result. That may be changing. In recent weeks, the State Department and White House actively have engaged the sheik and his organization. Sheik Muhammad Hisham Kabbani was one of the few Muslim leaders in America who warned against the jihadist and salafist threats. 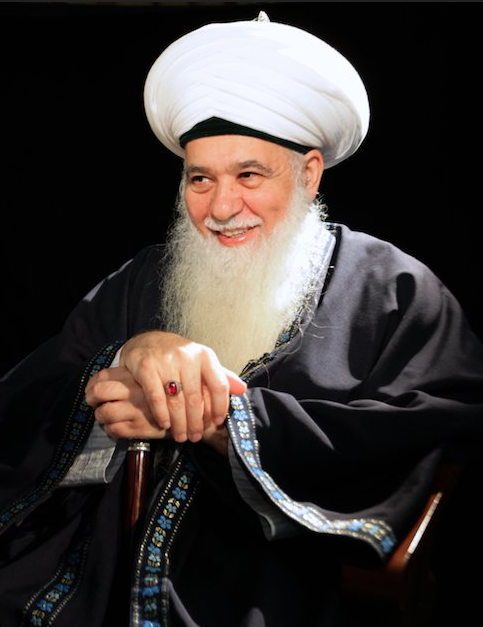 A native of Lebanon, Kabbani is a Sufi Muslim and an internationally respected Islamic scholar whose teachers trace directly back to the Prophet Mohammed. He is part of a respected family of traditional Islamic scholars that has led the muftiate of Lebanon for the last 150 years. His cousin is the grand mufti of Lebanon, the ultimate authority of Islamic rulings in that country. J. Michael Waller: How did you come across the violence-oriented strains of Islam in America that clashed with the traditional Islam you learned in the Middle East? Sheik Muhammad Hisham Kabbani: I was raised in a very conservative family and studied at the American University of Lebanon. At the same time my uncles, my father’s family and my mother’s family were running the religious Muslim affairs of Lebanon. So I was raised in a family that knows Islam very well. We are very well-rooted in Islam. When I came to the United States, I saw what was being implemented here was not the classical Islam that 90 percent of the Muslims around the world adopt or practice. I began to realize that it was the Wahhabi Islam. From the beginning, we knew we had to stand up. We knew the danger that would come with that ideology. So we said we would not be part of any of their literature. We have our own, and it has to be only classical Islam, the pure Islam that came to us 1,400 years ago from the time of the prophet through the majority of Muslim scholars around the world. Not the scholars of Saudi Arabia. So we stood up and we told people and we educated them about that kind of Islam. JMW: You’re unusual among Muslim leaders in America. More than condemning terrorism, you actively have warned of the terrorist dangers to U.S. national security. MHK: I tried my best to be patriotic and to do something against violence and against causing wars in the world, and I saw there was a danger. Many Muslims in the United States were aware of the danger, but they didn’t have the capacity to speak on behalf of the Muslim community because the microphone has been hijacked. JMW: In what way has the Muslim community’s voice been “hijacked”? We found a lot of American Muslims saying, “We don’t know what Wahhabism is.” Unfortunately, American converts were naive; they didn’t know that there was Wahhabi Islam. Muslims born and raised here don’t know the difference. The Islam they are seeing now is brought from the World Muslim League and World Assembly of Muslim Youth. MHK: Yes, Saudi organizations that were brought here to America. And they’re spreading Wahhabi Islam, and people think it’s Islam because it’s coming from the land of the two holy cities. No one will understand unless he is a scholar and knows Islam from back home. JMW: What was the response to your warnings? MHK: It caused a lot of commotion in the Muslim community. It opened their eyes. In the beginning of 1998 we began to publish The Muslim magazine, which was very well-accepted in the leadership community, in the administration, the U.S. State Department and the Muslim community. We began to expose everything. We spoke about [Osama] bin Laden, we spoke about the extremist groups in America, how they are using the centers, how they are using the Muslim mosques, how the ideology of Wahhabism is spread, how the leadership is implementing it but how the Muslim community in general is not accepting it. It went very well. JMW: The State Department invited you to speak about it. JMW: You didn’t name names, you just said in general these were the trends that you saw coming? MHK: Yes. I said 80 percent of mosques are being exposed and the leadership is vulnerable to extremist Wahhabist ideology and that the majority of Muslims do not accept it. JMW: What was the reaction by the more Wahhabi-influenced groups? MHK: They twisted what I said and lied to the community. They wanted to shut us down. JMW: How do they operate in the United States? MHK: This Wahhabist ideology, these Muslim national organizations, as they call themselves, operate much like the communists. They go to the poor people, they go to the grass roots and pick up stories or incidents and make them public, acting as champions of the Muslim community, [say] “these people are being discriminated against. We have to help them, we have to stop that, we have to criticize the government and the administration.” The Wahhabi groups share their boards of directors. JMW: Interlocking directorates. The old Soviet-front model. MHK: The same. They share meetings at the top level. JMW: Many voices with the same message, but it’s all centrally organized. MHK: Yes. That is un-Islamic. That’s never happened in Islamic religion. I consider it a hypocrisy. JMW: A few months ago at a news conference, you mentioned that the Bush administration needed to do its homework about which American Muslim groups it works with. Has it done so? MHK: I met with the president on Sept. 6. The president is really a spiritual person, a very loving and caring person. He liked me and I liked him. It was a very positive meeting, but I think a few in the administration at the lower level have been trying their best to block us from being invited. MHK: It’s obvious. The Wahhabi lobby is very strong. The homeland-security chief and the Treasury secretary had a meeting in Detroit [with Muslims and Arab-Americans] last spring. We asked many times to be included. We knew that the invitation went out, but it didn’t come to me. We know it was stopped somewhere. JMW: What is one of the main differences between the more radical but more influential Muslim groups in Washington and yours? MHK: They’re claiming that we are not representing Muslims, which is incorrect. We bring people to Islam for its moderation and its love. They make people run from Islam because they are radical and violent. So they try to cut us down as much as they can, from wherever they are able. JMW: Yet some of these prominent Muslim lobbyists aren’t even practicing Muslims. It’s kind of like Catholics for a Free Choice, claiming to be Catholic while promoting views that are anathema to the religion’s teaching. MHK: That’s what’s so amazing! There’s one person who is lobbying for Muslims; he moved to a lobbyist firm now [but] I don’t want to mention his name. And he’s not a practicing Muslim! Al-Jazeera asks him questions and he speaks as if he’s the top of the Muslim community in America working with the White House. He has no grass-roots support, he has no constituency. JMW: Yet that connection gives them inordinate political influence? MHK: Unfortunately, when our government legitimizes them, they go back to the Arab countries, the Persian Gulf countries and tell them, “Look, we are working on behalf of Muslims, and this is the president, and we are working with him, advising him,” and they get more money for their own purposes, not for the betterment of Muslims! JMW: Have you encountered any racial profiling? MHK: I’ve been through many airports and been profiled, but I don’t say anything. At the beginning it was mostly profiling of Muslims. But now I’m surprised because they’re not profiling Muslims too much because they are yelling too much. They’re profiling [laughs]. MHK: I was surprised; one lady with two kids and they’re very tired. She’s young, blond, blue eyes; kids blond, one boy, one girl. She’s traveling from La Guardia [airport in New York] to here [Washington], and I was in La Guardia coming back to Washington. That poor lady–I saw 10 people on the plane who were Muslims, you could see them, and not a single one was profiled. And that poor lady was searched–her luggage, her children, everything. Maybe it’s a policy to balance, to show, okay, we are profiling everyone. But for me, there are limits for profiling. You cannot profile, detain someone, without anyone knowing about it. Then you would be doing what we are experiencing in the Middle East or in communist times. That’s not fair. JMW: What kind of extremist activity is going on in American prisons? MHK: Our organization gets a lot of mail from the prisons. We built up a good relationship with them for many years. So after we were boycotted following my 1999 speech, we began to find prisoners sending us letters asking what’s going on, and telling us that our books are being confiscated by chaplains and by the officers. We were surprised–prison officers confiscating our books. JMW: But not Wahhabi books? MHK: We found out that prison chaplains are certified by a certain accredited school here, not U.S. government-accredited, but accredited by a certain overseas country. With the certification program, we found out that most of them have been trained in the Wahhabi ideology. That is going on in the prison system. Prisoners wrote us letters: “We don’t have the literature to fight their extremism. Please send us books.” We sent books, but the prison authorities throw them away. They won’t let our material in the prison because the chaplains confiscate them. JMW: Have you brought this up with the Bureau of Prisons? [photo caption] Muhammad Hisham Kabbani, right, as a youth with Sheik Add Allah in 1967. Family: Wife, Hajjah Saziha Adil, a direct blood descendant of the prophet Mohammed. Four children and six grandchildren. Currently: Chairman of the Islamic Supreme Council of America in Detroit; founder of the Naqshbandi Sufi Order of America; founder and president of The Muslim magazine. Education: Bachelor’s degree in chemistry, American University of Beirut. Medical studies at Louvain, Belgium. Degree in Islamic divine law from Damascus, Syria, under the tutelage of Sheik Abdullah Daghestani. Career: Lecturer at universities and spiritual and religious centers in North America, Europe, the Far East and the Middle East. Publications: Author of numerous articles and books on Islam and spirituality, including the Encyclopedia of Islamic Doctrine, Classical Islam and the Naqshbandi Sufi Order, and Liberating the Soul: A Guide for Spiritual Growth and In the Mystic Footsteps of Saints.